← A Nanosilver Bullet against Tooth Decay? Are You Only Partway Cleaning Your Teeth? Brushing and flossing go together. Most of us know this, but while most of us manage to brush at least twice a day, only about half of us floss even once a day. In other words, half of us are only partway cleaning our teeth. A toothbrush can remove biofilm (plaque) from the exposed surfaces of your teeth, but it can’t thoroughly clean between teeth or below the gumline – areas that oral microbes love precisely because they’re dark, moist and harder to get to. Not flossing lets these microbes thrive. The result? Periodontal (gum) disease and, ultimately, tooth loss. What’s more, gum disease has been linked to other inflammatory conditions such as heart disease, diabetes and stroke. So not only does flossing support good oral health but good systemic health, as well. It may even help your memory. 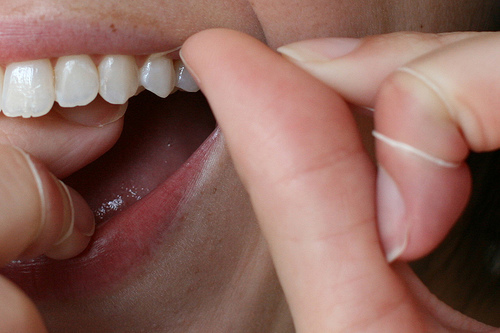 It makes you wonder: Is flossing a “natural” behavior of sorts? If so, then why do so many of us humans not just avoid it but come up with all kinds of excuses for it? The most commonly given reason is a lack of time – even as brushing and flossing together take less than five minutes. But if you’re that pressed for time, why not multitask? Floss while you’re in the shower, say, rinsing your hair, or while you’re relaxing with TV or a book after dinner, or sitting at home in front of the computer . Once you make flossing habitual, it won’t seem to take much time at all. Besides that, as the health of your gums improves, flossing will no longer cause bleeding or irritation, eliminating a couple more of the common excuses. And if standard, thin floss hurts your fingers, switch to thicker, softer dental tape. Bingo! Another excuse gone. To learn more about the correct way to floss, see the guides at About.com and Animated-Teeth.com. Comments Off on Are You Only Partway Cleaning Your Teeth?